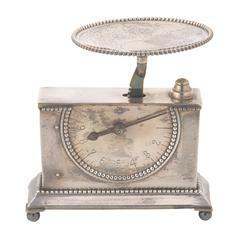 Rectangular base housing scale mechanism with circular dial markings and brass needle, outlined in beading, on plinth with ball feet. The circular dish outlined with beading is supported by ratchet attached to scale mechanism through outer surface of base. Mark: Marked on mechanism, incuse: [Wilcox Silverplate Co. trademark] / Pat, Jany. 1893 / Sept. 5, 1893. H: 3 3/4 in. W: 3 3/4 in. DIAM: 2 1/2 in.